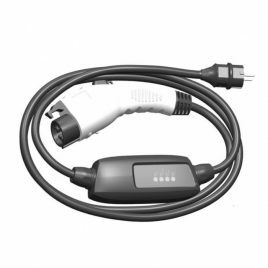 EV Charge + charging cable Type 2 with ControlBox 16A. Allows charging from 230V mains. IEC 62196 Type2 to Schuko cable for Mode 2 charging with ControlBox. This cable allows you to charge your EV/PHEV that has Type 2 port from mains. Although is not recommended for everyday use, it is advised to have this charger as a spare for emergency situations. Happy with the purchase, i am using it for my everyday ev charging at work. Fast shipping service! Happy to use as spare charger when i need extra energy from any home socket. Good product for sure.